The world is a big place, but it's gotten smaller with the advent of technologies that put people from across the globe in the palm of one's hand. And as the world has shrunk, it has also demanded that things happen ever faster—including the time it takes to charge an electronic device. A cross-campus collaboration led by Ulrich Wiesner, professor of engineering in the at Cornell University, addresses this demand with a novel energy storage device architecture that has the potential for lightning-quick charges. The group's idea: Instead of having the batteries' anode and cathode on either side of a nonconducting separator, intertwine the components in a self-assembling, 3-D gyroidal structure, with thousands of nanoscale pores filled with the elements necessary for energy storage and delivery. 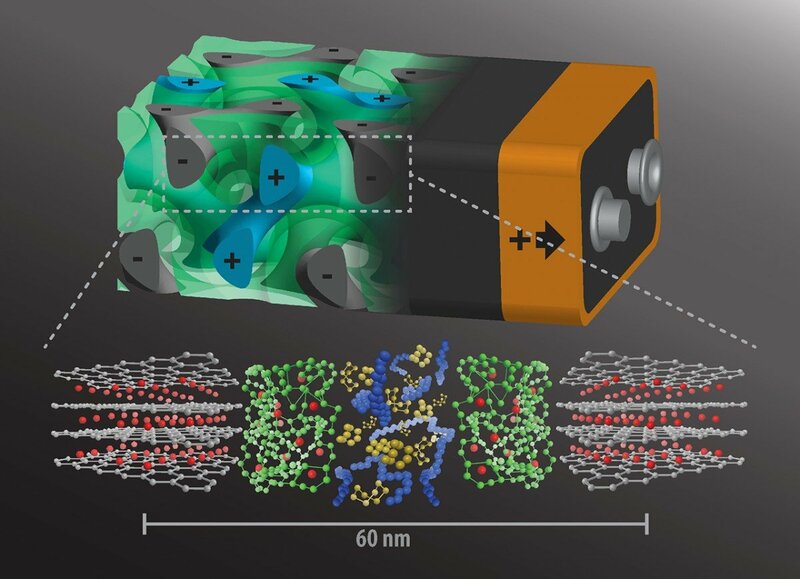 "This is truly a revolutionary battery architecture," said Wiesner, whose group's paper, "Block Copolymer Derived 3-D Interpenetrating Multifunctional Gyroidal Nanohybrid for Electrical Energy Storage," was published May 16 in Energy and Environmental Science, a publication of the Royal Society of Chemistry. "This three-dimensional architecture basically eliminates all losses from dead volume in your device," Wiesner said. "More importantly, shrinking the dimensions of these interpenetrated domains down to the nanoscale, as we did, gives you orders of magnitude higher power density. In other words, you can access the energy in much shorter times than what's usually done with conventional battery architectures. "How fast is that? Wiesner said that, due to the dimensions of the battery's elements being shrunk down to the nanoscale, "by the time you put your cable into the socket, in seconds, perhaps even faster, the battery would be charged."